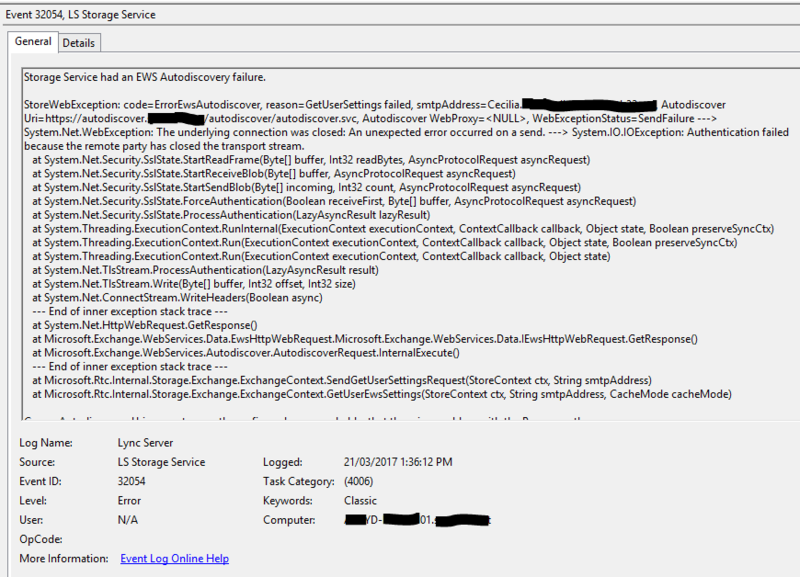 The well known and annoying Lync\Skype for Business event “Storage Service had an EWS Autodiscovery failure” error event. This event comes up in Skype for business server. There are 2 reasons this could happen. The 1st one is relatively easy. Use this Technet article to configure partner applications with Exchange Server. This will allow the features like Unified Contact Store and Exchange end Archiving to be enabled. If the Exchange is Exchange Online, then it gets little tricky. To get rid of this event, it requires to configure oAuth between Skype for Business server and Exchange Online. This one is little difficult compare to what mentioned above. Luckily, there’s a script written by Aaron Marks to simplify this. Now, for the reason 2, which is the main reason i’m writing this article. Till last November, there was no cure for this error. As Exchange 2010 does not support partner applications, there was no such integration possible. And the error keep on piling up. Luckily, this issue is now fixed with Skype for Business Server CU4 update, along with fixes for some other issues. Process to install this CU is exactly the same as before. Follow the steps mentioned the official article and it will be fine. The most important part is that, now we can get rid on this annoying error once and for all.